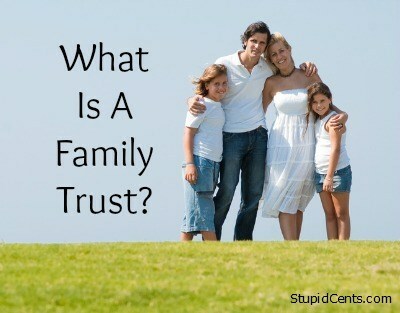 Family Trusts: What Is A Family Trust? You’ve probably hear the term “family trust.” However, most people associate these types of arrangements with wealthy families. While many wealthy families use family trusts to protect their assets, just about anyone can make use of these vehicles to provide a certain amount of protection for assets. A family trust is also sometimes called a revocable living trust. Assets go into the trust, and the trustee (or a group of trustees) manages the account on behalf of those you designate beneficiaries. You will need to re-title your assets so that the trust owns them. A revocable living trust allows you to make changes during your lifetime, so you can change the trustees and beneficiaries when you want, as long as you fill out the appropriate paperwork. The point of a family trust is to provide for the financial well being of your heirs while making sure that the money is used as you would like. What happens with your money is spelled out in the event that you die or are unable to manage your own financial resources. One of the main reasons that people set up these trusts is due to probate. The assets in a trust usually (check your state laws) pass seamlessly to heirs without probate because the assets are already in the trust, and to be used for their benefit. Your family trust can also ensure that the decisions you want made on your behalf are carried out. This is especially important if you become incapacitated. If everything is in your own name, it’s possible that others won’t have the same access to your accounts. A trust makes it easy for your trustees to make decisions on your behalf, through the powers of attorney set up through the trust, and your wishes are more likely to be followed. It’s easier than you might think to set up a family trust. If you are savvy in these matters, you can do it on your own, or perhaps with help from a site like Legal Zoom. However, if you want to make sure that everything is properly set up, you can have an estate planning attorney help you. Getting professional help can also ease the situation when it comes to re-titling your assets — particularly real estate assets. Make sure that your trust is revocable. There are some trusts, like the irrevocable life insurance trust, that result in you losing control over your money, and make it difficult to make changes to the trust. Your revocable living trust provides you with more flexibility and control over your own money. When you set up your family trust, make sure that the affected parties understand the goals of the trust, and how the money is to be used. The right set-up can provide a bit of a tax shelter from inheritance and estate taxes, as well as ensure that you are taken care of if you are no longer able to manage your own affairs. Thanks for this overview. I’ve been considering a trust to hold some property I own with a family member and haven’t understood very well how they work. This was very helpful!